Musings 'n scribblings of a philanthrope .. : Decathlon showroom at ETA Mall, Binnypet, Bangalore. Decathlon showroom at ETA Mall, Binnypet, Bangalore. On 23 August 2017, I got a good opportunity to visit a grand retail showroom of the European sports goods manufacturer, Decathlon in Bangalore. The objective was to involve the students from Alliance University in getting to know about the business processes that help world class performance and to to get some ideas on how to achieve lean setup in the organisation. The French sports eqpt manufacturer has 50 showrooms in India of which 10 are in Bangalore. When I took 60 students of first year MBA of Alliance School of Business, Bangalore for an academic study visit to know more about retail shopping and retailing layouts, little did we realize that we were witnessing a world class retailing environment ..
Shop Layout : In a 10,000 sq ft showroom the manner in which Decathlon had neatly organised the different sports equipments on shelves, fixed and movable, for different sports and pastimes like camping, trekking etc according to the sports classification was really worth observing and learning for the students. While the shelves near the walls are fixed, the shelves in all other places are fixed on castor wheels to enable quick rearrangement of the shop floor layout. Shop lighting : The lighting across the shopfloor was ambient and nearly perfect, not too high, nor too low. Passion : Employees display great passion for the sports area they represent - A great observation we could make out was the passion each of the showroom personnel had for his or her sports area. Working at Decathlon for these employees is their lifeline and passion. 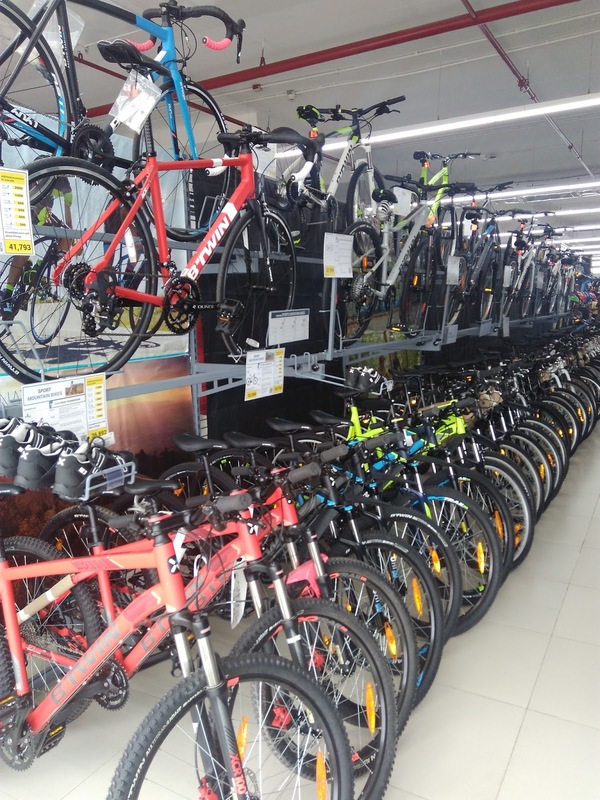 I have never seen any retail shop floor where employees have felt so much engrossed and passionate about the sports equipment they were trying to sell or explain to customers. The large showroom area also saw customers checking out the items and sports equipments on their own on the shopfloor to get a feel of the item. Footfall : In retail environments, it is usual to have higher footfall on weekends than on weekdays. The fast-moving equipments for the popular sports of cricket, football, basketball etc are kept at the farthest end of the store to ensure customers get to see the variety of items on the shop floor before they select these items and make a purchase. Low Costs and variety : The most attractive aspect of the store is the low costs for the sports equipments and sports accessories. The great variety of items catering to almost all sports, even scuba diving, cutting across different age groups, is definite to catch the attention of every customer. Product Arrangement : The items are supposedly of good quality and are arranged very conveniently at arms reach distance to a convenient vertical height, of about 7 feet. The shopfloor employees seemed to be quite aware of inventory management principles too. One of them was telling us how for each of the rack they have to pay rent and thus they are under constant pressure to improve the returns from the shelf space. Click here for the video of the interaction with the cycling passionate Anubhav. 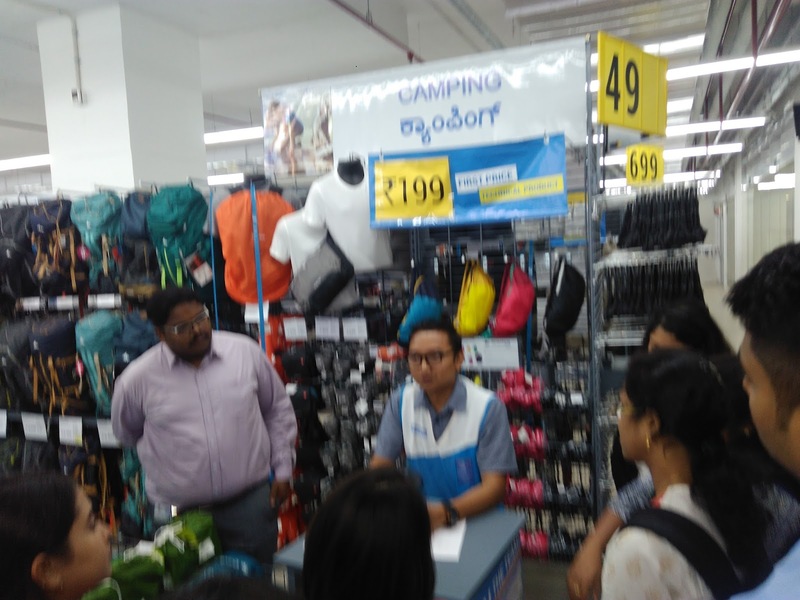 Sales channels : When some of the students asked the store personnel as to why Decathlon products are not available either on Amazon or Flipkart or any other e-commerce website, the reply was evident of the confidence Decathlon had for the products it was selling. Decathlon wishes to make a mark for itself through its efforts and not to piggyride on either Amazon or Flipkart. The indications are that Decathlon is slowly getting successful in their endeavours to establish online presence in India. Moreover their 52nd store coming up in the country soon. Customer Feedback : Feedback has a great role to play in the shopfloor layout as well as in improving the customer experience. Repeat visits from existing customers who come along with friends and family is a great way Decathlon reaches out to large sections of the population. Wishing them the best in their India operations over the coming years.. This is definitely a retail outlet management students should visit to get to know what are international standards in retailing layouts ..
PS : we wish to thank the management of Decathlon for allowing the students to visit the shopfloor.